The plumeria flower makes some of the most beautiful Hawaiian leis, plus they smell so good. I hope you will enjoy this lovely bouquet! 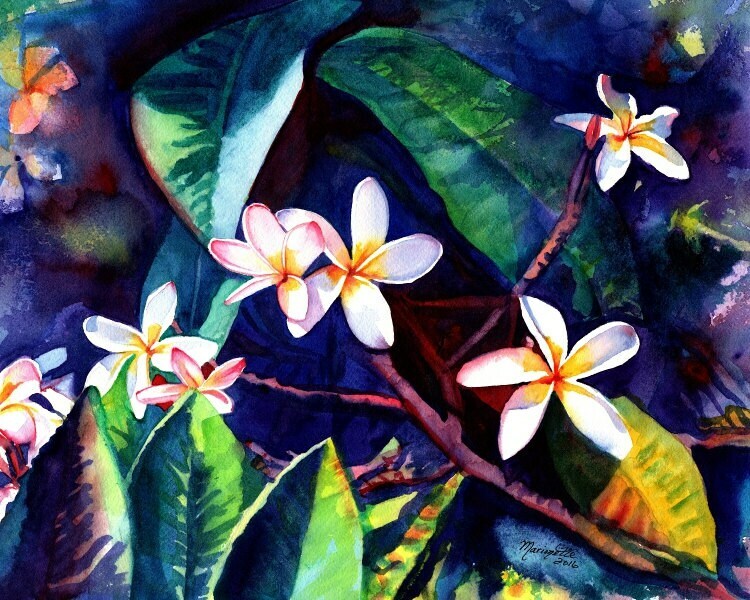 "Blooming Plumeria" This giclee print is signed by the artist and is printed with archival inks on radiant white watercolor paper. It is a reproduction of an original watercolor painting and comes packed in a clear sleeve with a backing board (unframed). Colors may vary slightly from monitor to monitor. The pictures of anything Marionette makes just don’t do it justice until you actually see it person. Was so love it with her Plumeria painting when I received it in the mail that I couldn’t resist buying another one.